I need to get better sleep… too much going on in my head regarding finances, my dog, and just general jitters-in-the=night! I don’t like using Photoshop, but when I want to mess with the colors without messing up a painting, I admit, it is useful. Painting by hand is so much more rewarding, though. I doubt that red would’ve picked up much enough to get a nice greenish-yellow that I wanted to test for the bushes. Oh well. I hope my twin, Mei, likes this one. For those of you that enjoyed Star Trek… Click on this Title! 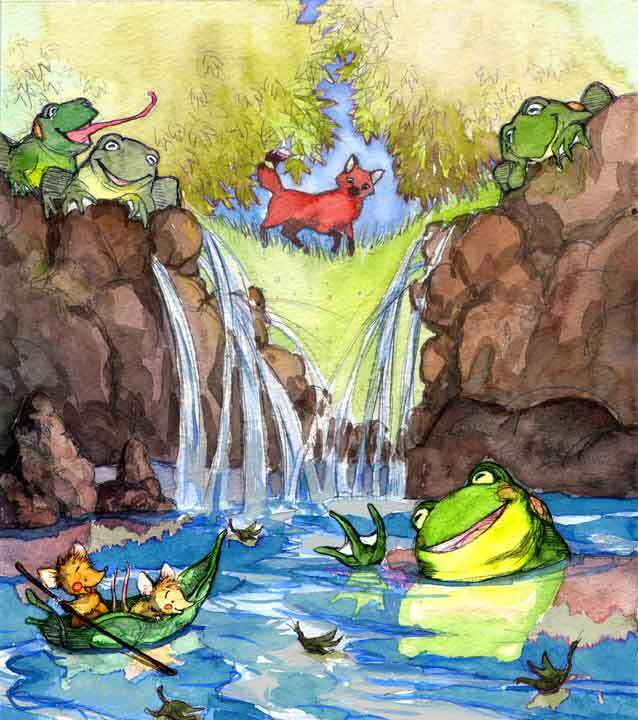 The question that popped into my head, before actually reading the post, was how do you revise a water color without starting from scratch.I really need to learn photoshop one day.I thought of Wind in the Willows when I first saw this one. I prefer this version with green! I see Photoshop only as another tool. And we should use it. Makes life easier!Keep the good work!